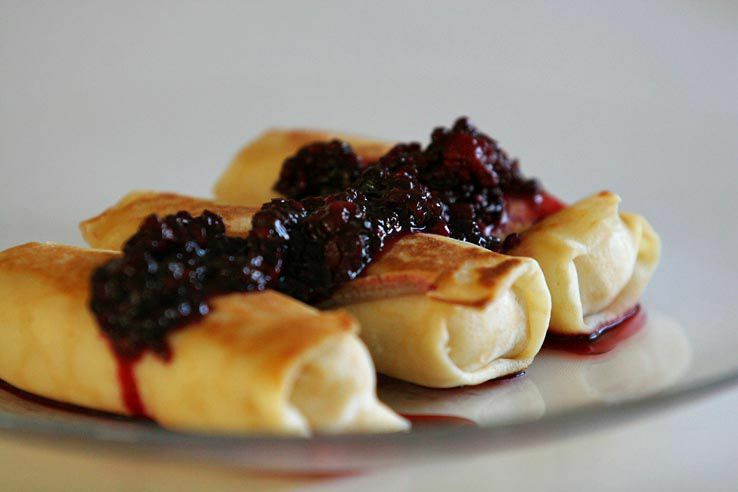 Sweet cheese filling goes well with sweet Polish nalesniki, also known as Polish blintzes or filled crepes. Once filled and rolled, they can be baked or pan-fried, or dipped in beaten egg and breadcrumbs and fried. Naleski fillings are ideal for any type of filled Polish dumpling, like pierogi, uszka, kolduny and kulebiak. These nalesniki are a good option for a vegetarian meal. Place cheese in the bowl of a food processor and puree until smooth. Add remaining ingredients and process until fluffy. Divide filling among 12 crepes and roll. Saute in small amount of butter and serve with fruit sauce, like fresh blueberry sauce, if desired.